Most of us are familiar with the sensation of “butterflies” in our stomach when we feel nervous before a big event. We might also experience an immediate “gut instinct” about someone when we meet them for the first time. Or what about that painful “gut wrenching” feeling brought on by emotional heartache? Not surprisingly, the connection between our mind and our gut goes well beyond a humble metaphor. It is now scientifically established that the gut and brain are intimately linked by a dynamic communication system involving hormonal, neuronal and chemical signalling. We know that stomach knots, nausea and a loss of appetite are symptoms often triggered by psychological stress, sadness, anger or elation. And by the same token, our diet and digestion has a direct impact on how we feel both physically and mentally; when food affects our mood. 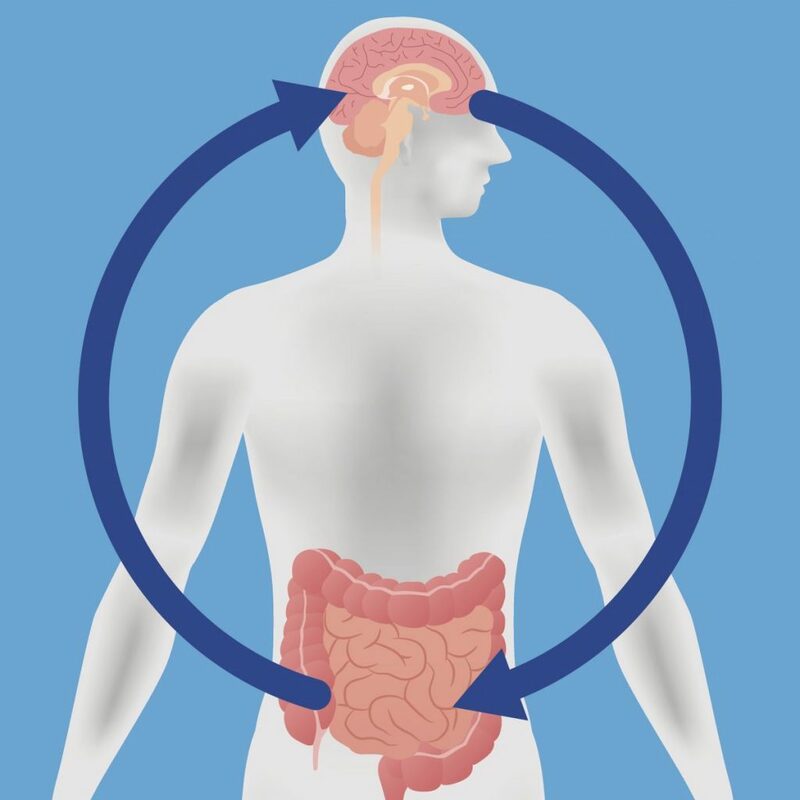 Within the last few decades the scientific community have taken an interest in understanding how and why these processes occur by closely studying the gut, brain and everything in between. Studies show that that this bi-directional relationship not only ensures the maintenance of gastrointestinal function but it also regulates a range of cognitive functions including memory, mood and attention. The mechanisms by which the gut and brain communicate is a fairly recent discovery and safe to say, it’s more than just a daily phone call! Hundreds of millions of nerve cells connect the Central Nervous System (brain and spinal cord) with the Enteric Nervous System (gastrointestinal tract) which allows the brain to consistently monitor and control the internal environment of the gut by adjusting the rate of blood flow, the speed at which food transits through the gut (gastric motility) and the secretion of intestinal mucus. In turn, feedback is provided to the brain about hunger levels and the ingestion of any disease-causing microbes. In fact, the microbiome has become a hot topic amongst neuroscientists studying the gut-brain axis. Research shows that intestinal bacteria talk with the Central Nervous System by modulating immune cells and stimulating endocrine (hormone) cells to produce neurotransmitters such as dopamine and serotonin. They concluded that the microbiome may play a role in brain health and the onset of some psychiatric conditions. In a number of scientific studies, germ-free mice demonstrated a weakened immune system and an exaggerated stress response compared to normal, colonised mice. An absence of microbes was also associated with poor gut function, altered expression of neurotransmitters, memory dysfunction, inflammation and an augmented experience of pain. The good news? Many of these neurological symptoms could be reversed with probiotic treatment to restore healthy gut flora! And while many of these discoveries are still in their infancy, the general consensus is that diverse and thriving intestinal flora are key to optimum gut and brain function. So what can you do to build a healthy, happy gut-brain axis? Alcohol, processed foods, sugar, stress and some medications are all considered common gut irritants. For some people, removing gluten and dairy can also provide quick digestive relief. The lining of the small intestine acts as a barrier between the environment of the gut and the rest of the body. Therefore, a robust gut lining can prevent food particles, bacteria and toxins from crossing over and entering the bloodstream. Focus on eating healing, unprocessed whole foods high in fibre (vegetables, seeds), protein and healthy fats. Once you have strengthened the integrity of the gut, it’s time to replenish the healthy intestinal flora! Probiotic-rich foods like sauerkraut, kefir and kombucha will boost the number of beneficial bacteria, while prebiotic-rich foods will help to nourish these happy microbes; think garlic, onion, leek and artichoke. Remember, if you are new to living foods introduce them slowly and in small amounts. Try these simple steps to improve the composition of your microbes to ultimately support gut function, regulate the immune system and positively influence your mood and cognition!